Venezuela refused to abandon its bid for Latin America's seat on the U.N. Security Council despite trailing Guatemala in 12 straight rounds of voting, creating a deadlock that led to new calls for the region to put forward a compromise candidate. In Tuesday's last vote — the 22nd over two days — Guatemala garnered 102 votes to Venezuela's 77. That result, similar to that of many of the previous rounds in the General Assembly, was short of the two-thirds majority of 120 needed to win, and diplomats said it appeared that neither would be able to bridge the gap. Despite trailing U.S.-backed Guatemala, President Hugo Chavez said Tuesday that Venezuela will not abandon its bid for a U.N. Security Council seat . 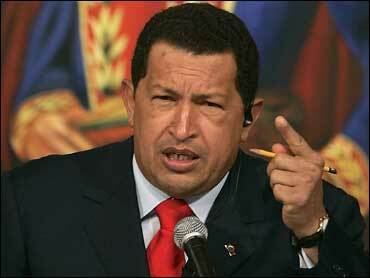 "Venezuela does not surrender," Chavez said in a speech Tuesday night. "I say it here to the whole world, Venezuela will continue waging this battle." Chavez called it a struggle against the U.S. "empire" and accused Washington of waging what he called a fierce campaign of "blackmail, pressure, threats of all sorts." The U.N. General Assembly will take a day off from voting on Wednesday to allow Latin American and Caribbean nations time to seek a way out of the standoff. The 23rd ballot will be held on Thursday morning. "It looks like things are frozen," Ghana's U.N. Ambassador Nana Effah-Apenteng said. Usually, the 10 rotating seats on the council are filled quietly, with the regional groups they are reserved for agreeing on a candidate to take the two-year term. But Guatemala and Venezuela both covet the seat that will be vacated by Argentina on Dec. 31, and their standoff has split the 32-nation Latin American and Caribbean Group. Venezuela's U.N. Ambassador Francisco Arias Cardenas said Venezuela would only leave the race if U.S. President George W. Bush or U.S. Ambassador John Bolton publicly agreed to stop what he claimed was a campaign of pressure on other nations to vote for Guatemala, its preferred candidate. Bolton rejected Cardenas' proposal, and denied pressuring anyone. "We have made our position in a very low-key way," Bolton said. "It's motivated by our concern for Venezuela's behavior." Guatemalan Foreign Minister Gert Rosenthal said by tradition, Venezuela ought to withdraw because it trails in the vote count. He suggested that his nation might be willing to step down, but only if Venezuela does too. Guatemala has led all but the sixth round, when it tied Venezuela with 93 votes each. Early in the day, staff from the Venezuelan mission passed out a photocopied article from the Spanish newspaper El Pais that included a photograph of Bolton speaking with Rosenthal in the General Assembly hall. Venezuelan diplomats said that was a sign of the U.S. collusion with Guatemala. They have also suggested that any nation voting for Guatemala is doing so at the behest of the Americans. The record number of rounds of voting for a Security Council seat is 155, set in 1979. The General Assembly was deadlocked between Cuba and Colombia after 154 rounds, and finally chose Mexico on the 155th. The seat Venezuela is seeking to fill is one of the 10 non-permanent seats on the council. While those members have no veto power, the United States fears that Venezuela could shatter the consensus that the council needs to pronounce itself on issues ranging from human rights abuses to violations of international law. South Africa, Indonesia, Italy and Belgium were elected on the first ballot on Monday to fill the four other rotating seats.